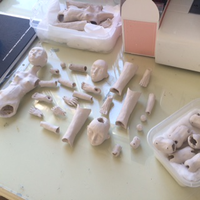 I started to cast the molds for my second porcelain bjd. I have a problem with some of my molds, when I cast these molds the parts comes out with huge holes around them... I tried to leave the porcelain in the molds for a longer time but then it doesn't pour out of the mold. Do you have any pictures of your problem? It sounds like maybe you have some air bubbles in your slip, but seeing a picture would help! I agree with Earthshine Doll. If your porcelain is too thick, you are more likely to have air pockets. You have to thin porcelain slip with sodium silicate, adding small amounts and carefully monitoring the viscosity with a hydrometer. If you add too much sodium silicate it will cause your slip to thicken. If you try to thin porcelain slip with water, you will increase the shrinkage rate and your work will have a crinkled look after you fire it. It is best to use your slip within 2 months of purchasing (as long as you are storing it in an airtight container) If your porcelain is older becomes thick, the easiest thing to do is throw it out and get new porcelain. Trying to use thick porcelain cause a lot of wasted time and heartache. I added distilled water to my porcelain and it helped a lot, I read about adding distilled water to porcelain in Woodland Earth tutorial, I wanted to ask if distilled water may cause problems during the firing like regular water may cause? Can I sand the greenware porcelain parts without soft firing it and get the same result of smoothness that you get after the soft firing? In my experience, adding any type of water causes a crawling effect on the fired work and increases the shrinkage rate. If the surface quality is not a critical component and you don't mind losing overall size during firing, then you are fine. You do not need to sand greenware, simply smooth the surface with a wet sponge, try not to get the work too wet because it can cause it to crack! Sanding greenware is also dangerous because it produces a dust with silica which is harmful to your respiratory system. Your results will not be as smooth as if you had soft fired and wet sanded the pieces, however, you may be able to smooth the high fired work with a rougher sandpaper and achieve a smoother surface. Always use a respirator/mask when work with any type of clay dust. Good luck!!! I will soft fire my doll parts to 900-1000C degrees and I wanted to ask if I can sand them in water after this firing (because it's a higher temperature than the regular soft firing of 700 degrees). 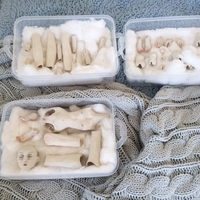 I'm also afraid that the fingers will break during the firing ( I casted many hands but I still worried about it...), perhaps they will break, is it possible to glue them back? If it does, which way is the best to do that? Yes, you can wet sand after that firing. The only reason the fingers would break is if they had air pockets or were not completely dry before you put them into the kiln. The high fire should actually make those fingers stronger and more durable (yet still fragile) You can use epoxy to glue the fingers back on if they break. Good luck on the firing, I know it can be unpredictable and sometimes heartbreaking. I wandered if you know why doll artists fire their porcelain pieces after sanding them and paint them after a second firing? Is it possible to paint a porcelain doll after sanding it without firing it after the sanding? I am glad to hear that your pieces survived the kiln! 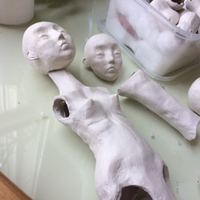 The reason porcelain dolls are not painted after the sanding is because the porcelain has only been soft fired at a low temperature at this stage. You have to put the pieces back into the kiln after the wet sanding and fire them at the high temperature to get the porcelain to reach maturity. When porcelain is not high fired it is not as strong and has a chalky texture. High firing brings about a smooth texture and makes your work as strong as possible. China paint is typically used on porcelain dolls. Once the porcelain has been high fired and becomes smooth, it takes the China paint much better than it would with a chalky, underfired texture. I am glad to help, I know how difficult it can be to find information about making dolls and working with porcelain. My parts came out of the kiln after the china painting, everthing went great! I also wanted to ask if i can sued my doll with fabric instead of leather (i don't want to use leather) and which kind of fabric will work best? awesome! She looks great! I've only ever used real leather to sued, but I imagine you could use a soft fake leather...and if you're not wanting her to hold crazy poses(the leather can help with added grip) you could use anything you want. It's really just so the porcelain doesn't rub together, which can cause chipping and extra stress on the joints. As far as assembly: If you are under time constraints, I would suggest stringing her fully with elastic. In my past experience, it took a long time-blood-sweat-tears-poked fingers-temper tantrums to get the springs tension just right. I know you said you had a show coming up soon, and it might save your sanity a bit! Just my opinion! Good luck! I look forward to seeing her assembled! Post some pics!